I purchased from you both the cartridge and the drum for my Lexmark E260d printer a while ago. Assuming the toner cartridge is empty, do I only need a cartridge? The Lexmark E260d toner and drum are replaced independently of each other so you only need to replace the item which has run out. Your printer should indicate whether you need to change the toner or the drum. Please note, the Lexmark E260d toner lasts for approximately 3,500 pages whereas the Lexmark E260d drum has a life expectancy of 30,000 pages so you'll need to change the toner cartridge more regularly than the drum. Which courier will be used for delivery of a Lexmark E260d toner twin pack? We use various couriers for our deliveries. This could include DPD, Citylink or UPS. Shopping for most affordable bargains on all your Lexmark laser toner? If your laser printer is running out of toner then you can get great savings by just ordering any of your new Lexmark E260d toner cartridges provider. With our competitive offers and our lowest price guarantee you can rest totally sure of finding the cheapest offer on your Lexmark E260d toners. We strive to meet the needs of each shopper by giving low costs along with top quality Lexmark E260d toner that will perform reliably every time that they're used. Fantastic Deals Today On Lexmark E260d Toner Cartridges! You can save money due to fast and free delivery on Lexmark toners. You can start to save now and order your low cost Lexmark E260d toner cartridges by using Cartridge Save's online store. Cartridge Save provide an top rated customer care team to help ensure that buying Lexmark E260d toner cartridge will be a quick and also uncomplicated shopping experience. Just remember that Lexmark E260d laser printer cartridges delivered by Cartridge Save are also covered buy our cast iron money back guarantee which allows you to claim a 100% refund if you are disappointed with a faulty cartridge. To find the cheapest bargain for Lexmark E260d laser toner cartridges order now at Cartridge Save. The Lexmark E260D is a workhorse printer that will meet any high-volume application that a small business or even corporation can throw at it. This laser monochrome printer is fast with a print speed of up to 35 pages per minute, but it can also print up to 17 pages per minute if using the duplex printing option. A maximum resolution of 1,200 dpi by 1,200 dpi is sure to create crisp prints that are not fuzzy. This printer also employs 2400 IQ technology that creates better prints through more accurate colours and image enhancement. The E260D can go the limit with a monthly duty cycle of up to 50,000 pages. The E260D is small and will fit on any counter that is available. Its dimensions are 40.64 cm in width, 25.90 cm in height, and a depth of 37.08 cm. At a weight of only 13.51 kg, the Lexmark E260D printer is easy to transport or store. Media is handled by a 250 sheet input tray and a single sheet manual tray. The output tray will gather a maximum of 150 sheets. 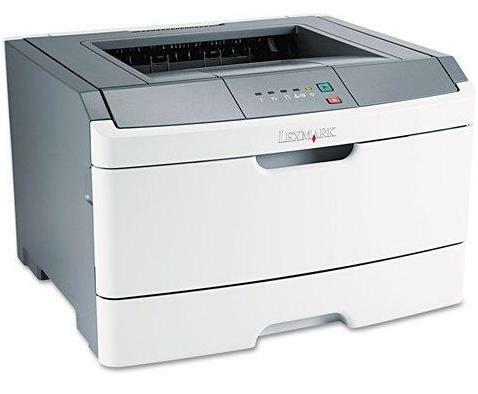 The Lexmark E260D is also built with a 400 MHz processor and 32 MB of RAM. If necessary, it is possible to upgrade the printer up to 160 MB of RAM using a memory expansion slot that is located on the printer. One of the best features on the Lexmark E260D is the ability use duplex printing, a feature that allows for documents to be printed on both sides of a page to reduce paper waste. This printer is extremely quick and can get its first print out in 6.5 seconds. In addition, Lexmark E260D toner is reasonably priced so your running costs won't be too high. The printer is also priced extremely competitively. One of the primary disadvantages of the Lexmark E260D is it cannot be set up as a print station for computers that are networked. This printer is also loud and has a sound level of 53 decibels during operation. The Lexmark E260D toner that comes with the printer is actually a starter kit that will only last 1,000 pages, which is a common practice among most manufacturers. However, E2620D toner replacements will have capacities of 3,500 pages or more and are easy to replace.